Oh no... your precious iPhone is in shambles. Maybe you shattered your screen after a crazy night of celebrating, or maybe your two-year-old jabbed a toy into your iPhone's charging port, completely destroying it in the process. Now what? Do you take it to a repair shop, or go to an Apple Store to have it fixed? This brief article will help you weigh your options. Apple and Apple authorized service locations like Best Buy will almost always charge less than anywhere else for repairing your damaged device. For example, an iPhone 6s without AppleCare+ coverage will cost $129 just to replace the screen. That same repair will cost you around $175 to $200 or more in your local repair shop. Why does it cost so much higher at local shops? The short answer is—there's a middleman. Part suppliers charge a premium for OEM screens. While the cost can vary depending on LCD quality and vendors, repair shops usually add on about $40 to $60 for labor on top of that part to earn a little profit. Local repair shops will argue that turnaround time is significantly better than corporate stores, which is also reflected in their higher prices. Unlike corporate repairs, you usually don't need to make an appointment at a local shop, and a screen replacement can be done in as little as 10 minutes, depending on their workload. Apple and Apple authorized service locations usually require that the customer make an appointment and schedule a repair. Once in the store, wait time can take from 1-3 hours. Then Which Should I Use? Now that you know the basic advantages and disadvantages of both routes of iPhone repair, which one would be a better pick? As someone who has fixed his fair share of phones and tablets, I usually recommend for customers to take the Apple Store route if their iPhone is still under a year old and still under warranty—or if they have AppleCare+ coverage. If you've paid for or are paying monthly for AppleCare+, now is the time to use contact the Genius Bar and make that appointment. If it's just a screen replacement, you'd only pay $29 plus tax. At most you'd pay $99 plus tax. While physical damage voids Apple's warranty itself, the customer will be better insulated from further aggravations and heartbreak if problems persist after the initial repair. 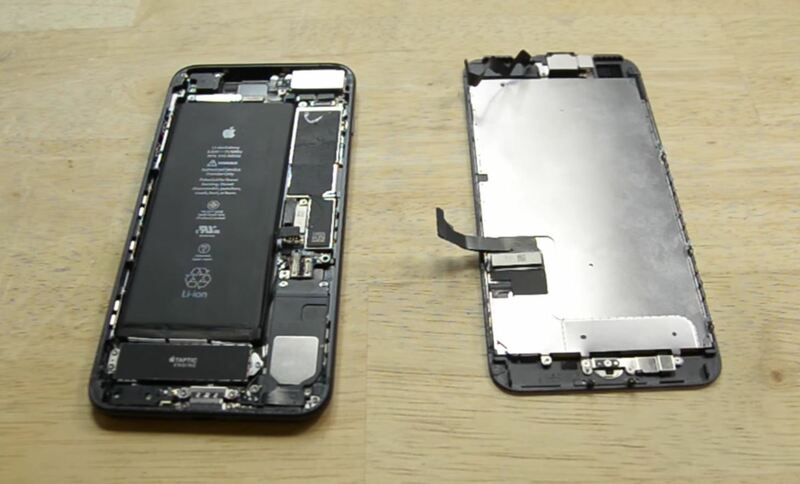 Plus, partial warranties may still be given by the company after they repair the iPhone. Those warranties will be null and void the moment that same phone is opened by a third-party, unauthorized technician. If you are left with no other choice but to take your phone or tablet to a local, unauthorized repair shop, here are some helpful tips to help you choose the right spot. Beware of shops that charge significantly less than their competitors. Remember that device that's glued to your hand costs more than the average sub-Saharan African makes in a year. If their repairs cost less than others, chances are they're using subpar parts or refurbishing parts themselves. Refurbished LCDs are especially problematic for iPhones with Touch ID built in, since 3D Touch may not work properly after the LCD is rebuilt. The timeless adage that "you get what you pay for" gets a lot of play on this one, trust me. There are exceptions, however, like if you're trading in your damaged device to upgrade to a newer model, then a cheaper shop is a good way to go. When you bottom line it, a repair shop is ultimately customer service-based. I've worked with too many techs that have failed to see this fundamental truth. They can solder an LCD connector with cold, cruel efficiency and even pull a Lazarus on a rusty iPhone that drowned on a beach, but they fail spectacularly when talking to a customer. So read reviews on shops that you're looking at on Yelp, Facebook, and other places they're listed. You'll be surprised to find that a majority of bad reviews aren't due to horrific repair jobs, but terrible customer service. The last thing in the world you need when getting your device fixed is be judged and treated like an idiot. I can't stress this enough... read the reviews. No matter how smooth a repair goes, some will inevitably return to the shop. Parts aren't perfect. They can have issues down the line such as a screen coming off its frame due to poor adhesion. Always ask what a store's warranty policy is on their parts and repairs. Techs will almost never bring it up to a customer—until they bring their device back for varying issues after the job was done. Warranty policies can differ wildly from store to store; from 14 days all the way up to 180 days against defects and/or negligence. Stores with longer periods are the obvious choice; ones that have great policies often take pride in their work and the parts (OEM vs. third-party) that they use. Just know that if you drop your iPhone again, it likely won't be covered by any warranty. What it all comes down to basically is—do your research. There's really no reason you can't find the best cheapest option available after considering all of the above. No matter what you end up doing repair-wise, always back your device up! While data loss resulting from a repair rarely happens, it can happen. One of the first things I was taught as a technician was to never guarantee data, so don't expect anyone to. If possible, back up your busted device before you go in, and then always back up on a regular basis after getting it fixed. Also, if you have that DIY spirit, chances are you'll want to try an "easy-sounding" repair on your own. In most cases, I advise against this, since a lot of customers end up coming to me with iPhones even worse off than before. If you know what you're doing, then go for it. If not, stick with the options above—especially if you have AppleCare+. I'll be covering some do-it-yourself fixes that most people can actually do in later guides, so be on the lookout for those.